This perfume is a spicy amber-heavy Oriental with a base of our house vanilla (Estate Vanilla), sweet opium smoke, pink carnations, Moroccan rose absolute, olibanum resin and a touch of cool powdery orris root. It's a very spicy, sweet, rich amber blend steeped with pink carnation petals. Goes on strong and takes a few minutes to settle down and meld with your skin chemistry before you can get an impression of the true fragrance but when it begins to unfurl it is thick, mysterious, elegant and haunting at once. A sophisticated perfume that is completely different than our more carnation-heavy Winter Dove, which is a sweet gourmand vanilla carnation. 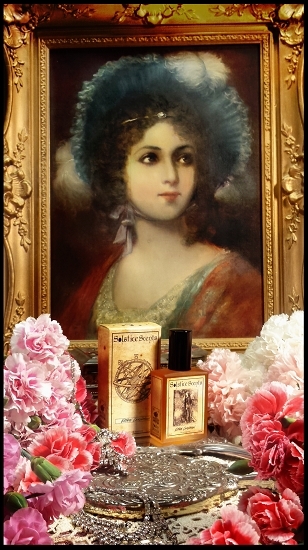 Estate Carnation is very complex and deeper, a sultry golden perfume. This does not open with the spicy carnation I was expecting, but sweet tendrils of opium! What a surprise! A good one, as I love opium (uh, the scent ;p). This feels very Victorian to me. I feel like I'm detecting something akin to a carnation scented body powder. Oh, I know what this is reminding me of, my Grandmother! Not really because she wore something, more that I remember exploring her large house (she had 9 kids!) and came upon some body powder in a closet somewhere and it smelled similar to this. I remember thinking how classy it smelled. This has that same "classy" feel to it. I like it a lot. As it dries the Estate Vanilla comes out more. Estate Carnation just says "high society" and "Victorian" to me. Though I'm not entirely sure it's a "me" scent I will use the tester and see what the husband thinks. This is really a beautiful and complex carnation scent - what I like most about it is that I don't get any musty or harsh clove notes! For some reason it seems that 90% of carnation based scents have clove, which tends to overpower the carnation, and fortunately EC doesn't. The carnation is delicate but robust, it's well complimented by crisp, unsour roses. I get a boozy kind of vibe from this, perhaps that's the opium note, which I'm not familiar with enough to be able to identify. It's overall a sophisticated and unique scent, with very subtle pepperiness and a bit of sweet vanilla. It dries down to something reminiscent of Molinard Habanita or pre-1950s Caron Bellodgia on my skin - a beautiful, slightly powdery floral. Lovely! If you enjoy classic perfumes, I think this would be right up your alley. I would love this scent if it didn't have the opium in it, because the carnation-rose-orris-vanilla combo is so beautiful. It's creamy floral from the orris and vanilla, spicy floral from the carnation, and fresh from the rose. The opium just gets stronger and sharper on me over time, though, drowning out the other notes for me. I definitely recommend trying this if opium plays nice with you, though.